Scale defensive stats relative to a universal scale and gives your players a way to increase and decrease damage without having to provide pure stats. Adds new gameplay mechanics such as Armor Penetration and Armor Reduction into your game! This plugin requires Damage Core. This plugin requires YEP_DamageCore. Make sure this plugin is located under YEP_DamageCore in the plugin list. This plugin serves as a damage balancing plugin to make numbers across the battlefield more universal for both actors and enemies alike and gets past the flaws that ATK – DEF formulas have. 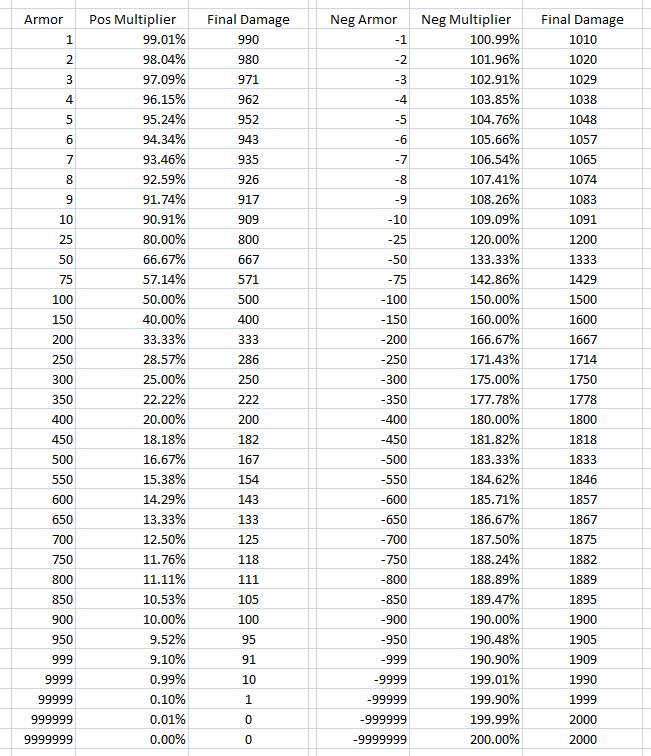 To get an idea of how armor scaling will affect damage, here’s a table on how 1,000 base damage is affected. Using the default base armor formula of 2 defense points is equal to 1 armor, this means at 200 defense, a battler will take only 50% damage. At 999 defense, the battler will take a little bit more than 16.67% damage. At those values without armor scaling, damage can be entirely undone for that very matter. This goes to show how effective armor scaling can be to maintain long-term balancing. There are various modifiers that can alter the armor level before the armor scaling rate is applied to damage. Armor goes through four main steps and they are as follows. In step 1 (Armor Reduction, Flat), the target’s armor is reduced by a value. Flat armor reduction stacks additively. Flat armor reduction can reduce a target’s armor below zero. For example, if an enemy with 10 armor has their armor reduced by 25, the enemy will have -15 armor. Armor reduction values are provided by target and not the attacker. In step 2 (Armor Reduction, Percentage), the target’s armor is multiplied by a percentage (100% – the listed value). Percentage armor reduction stacks multiplicatively and is ignored if the target’s armor is 0 or less. Percentage armor reduction makes a bigger difference on targets with higher armor. For instance, with 40% armor reduction, a target with 200 armor will lose 80 while a target with only 50 armor will lose 20. Armor reduction values are provided by the target and not the attacker. In step 3 (Armor Penetration, Percentage), the target’s armor is multiplied by a percentage (100% – the listed value). Percentage armor penetration stacks multiplicatively and is ignored if the target’s armor is 0 or less. Percentage armor penetration makes a bigger difference on targets with higher armor. For instance, with 40% armor penetration, a target with 200 armor will be considered as having 80 less while a target with only 50 armor will be considered as having 20 less. Armor penetration values are provided by the attacker and not the target. In step 4 (Armor Penetration, Flat), the target’s armor is treated as being reduced by an amount for purposes of damage calculation, but cannot be reduced below 0. Flat armor penetration stacks additively. Armor penetration values are provided by the attacker and not the target. You may use these notetags to adjust various factors for armor scaling rates and calculations. Causes the skill/item to reduce the target’s armor level by x. This is calculated first above everything else. Causes the skill/item to reduce the target’s armor level by x%. This is calculated second but is ignored if the armor level is less than 0. Causes the skill/item to reduce the target’s armor level by x% (but will not go past 0). This is calculated third. Causes the skill/item to reduce the target’s armor level by x (but will not go past 0). This is calculated last. This notetag allows you to bypass the armor scaling process for this individual skill/item. Causes this actor to lose x armor when targeted by physical skills/items. This is calculated first. Causes this actor to lose x armor when targeted by magical skills/items. This is calculated first. Causes this actor to lose x armor when targeted by certain skills/items. This is calculated first. Causes this actor to lose x% armor when targeted by physical skills/items. This is calculated second. Causes this actor to lose x% armor when targeted by magical skills/items. This is calculated second. Causes this actor to lose x% armor when targeted by certain skills/items. This is calculated second. Causes this actor to cause the target to lose x% armor when using a physical skills/items. This is calculated third. Causes this actor to cause the target to lose x% armor when using a magical skills/items. This is calculated third. Causes this actor to cause the target to lose x armor but not drop below 0 armor when using a physical skills/items. This is calculated last. Causes this actor to cause the target to lose x armor but not drop below 0 armor when using a magical skills/items. This is calculated last. Causes this actor to cause the target to lose x armor but not drop below 0 armor when using a certain skills/items. This is calculated last. This enables you to set a custom positive armor calculation rate for the skill/item instead of using the default positive armor rate. This enables you to set a custom negative armor calculation rate for the skill/item instead of using the default positive armor rate. This enables you to set a custom way for the skill/item to calculate the base armor value used for armor scaling. If you have YEP_BattleEngineCore.js installed with this plugin located underneath it in the Plugin Manager, you can make use of these extra armor scaling related action sequences. Causes the skill to have a global armor pentration property of either x or x% rate. This property is reset at the end of the action sequence. Causes the skill to have a global armor reduction property of either x or x% rate. This property is reset at the end of the action sequence. Resets global set armor penetration properties. Resets global set armor reduction properties.